The Eloquent Woman: Famous Speech Friday: Jill Abramson's "to anyone who's been dumped"
Famous Speech Friday: Jill Abramson's "to anyone who's been dumped"
As it turns out, getting fired right before giving a commencement address is not a bad thing for a speaker. It worked for Carol Bartz, fired as CEO of Yahoo, in her 2012 commencement speech at the University of Wisconsin, another Famous Speech Friday entry. 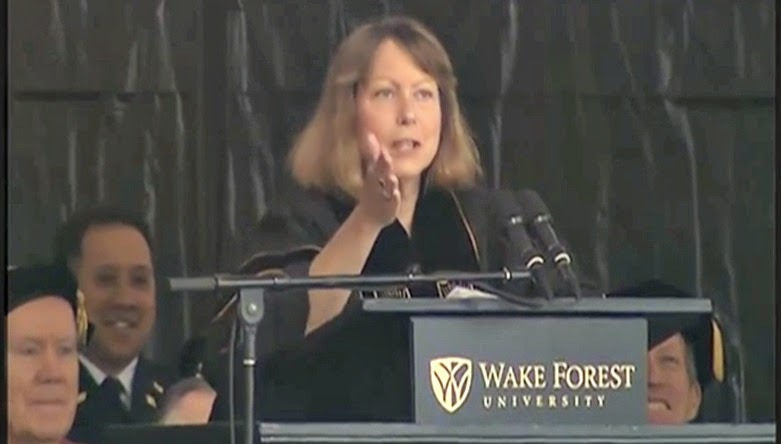 In the case of Jill Abramson, who was fired suddenly from her post as the top editor at the New York Times just days before, it made her speech at Wake Forest University a news event this week. The university live-streamed it, Twitter lit up with people watching from afar, and the media (including the outlet that fired her) covered it like a blanket, giving her a great opener: "I think the only real news here today is your graduation from this great university." Her advantages in giving this speech went far beyond the news cycle. Audiences love immediacy and the unexpected, two things in short supply at most commencements. Because Abramson passed on the option to describe her firing publicly as a resignation, a hailstorm of criticism rained down upon the Times, which reacted by describing her as a divisive force in the newsroom, citing that--rather than pay disputes or gender discrimination--as the reason for her dismissal. So this speech, her first public statement since her firing, would be dissected in the moment for signs of turmoil, blaming or cheap shots taken against her former employer. One reporter at the Times said of the paper's handling of her departure, "The lack of decorum was stunning," even as he predicted this speech would be her chance to return the favor. It meant more to our father to see us deal with a setback, and try to bounce back, than to watch how we handled our successes. 'Show what you are made of,' he would say....and now I'm talking to anyone who's been dumped--you bet--not gotten the job you really wanted, or received those horrible rejection letters from grad school. You know the sting of losing, or not getting something you badly want. When that happens, show what you are made of. Abramson took the high road in speaking about the Times, calling her editorship "the honor of my life." But she gave a nod to efforts to characterize her as pushy and bossy in the wake of her firing. She noted that she wrote a book, Strange Justice: The Selling of Clarence Thomas , about Anita Hill--another Famous Speech Friday notable--reminding the audience that the all-white, all-male panel of U.S. Senators called Hill "a little bit nutty and a little bit slutty" after hearing her testimony about harrassment by a U.S. Supreme Court nominee. There was no need to point out to the grads that history repeats itself. What can you learn from this famous speech? Use your speech to define yourself: In the days leading up to this appearance, Abramson was described in all sorts of negative ways by her former management--none of which was on display in this pleasant, gracious, funny speech, which put the focus back on the graduates again and again. It's always good policy when you've become a sideshow to point people to the main event, and Abramson described herself to the graduates as a parent, as a leader and as a fellow traveler in uncertainty. Her delivery demonstrated grace under pressure. Use humor with vulnerability, but don't deprecate yourself: Lots of women speakers wonder about how to use humor well, and this is a good speech to study. Having already been kicked out of a high-profile post, Abramson avoided using humor to deprecate herself further. Instead, she got laughs by being vulnerable and creating a bond with the audience: "What's next for me? I don't know. So I'm in exactly the same boat as many of you...and like you, I'm a little scared but also excited." Adjust your analogies: Abramson concluded with a riff from a 1956 commencement speech by poet Robert Frost, about life after graduation as "pieces of knitting to go on with." She explained it and updated the analogy along the way, letting it speak to the different generations in the audience: "What he meant is that life is always unfinished business, like the bits of knitting women used to carry around with them to be picked up at different intervals. And for those of you who have never knit, think of it as akin to your Tumblr, something you can pick up from time to time and change....get on with your knitting!" You can see the full speech in the video below. What do you think of this famous speech?